Defender® Fixing Silicone Adhesive is a specially formulated glue specifically designed to use with bird spikes and pigeon control spikes. This spike adhesive can be used on most clean, dry surfaces such as wood, glass, steel, concrete and brick, to name but a few. The fixing silicone reacts with the polycarbonate bases of the Defender® Bird Spike range to create a tough, strong bond. Once the spike adhesive has cured, it will hold the bird spikes in place for years to come, keeping pigeons and birds away from homes and properties. Defender® Fixing Silicone Adhesive Glue has been designed with the Defender® Pigeon, Seagull and Bird Control range in mind. It is a neutral cure silicone which gives it extra grab and a high adhesive strength, meaning it will stick to virtually any clean, dry, porous or non-porous surface, quickly and securely, making it perfect for the installation of pigeon spikes. It also means it has no nasty smell, which is associated with some chemical based silicones. Defender® Spike Fixing Adhesive is a low modulus silicone, thereby retaining a certain amount of flexibility when cured. It takes 24 hours to fully cure. 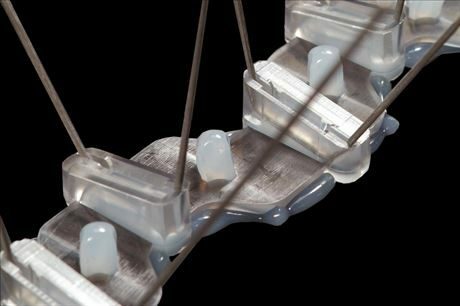 However, its high tack make up, its gel consistency, and the silicone fixing holes in the bird spike bases mean it holds the Defender® Pigeon Spikes in place immediately. The only specialist tool needed to use 285 ml tube of Defender® Fixing Silicone is a caulking gun. Cut open the end of the fixing silicone tube, apply the application nozzle and insert into the caulking gun. The perfect size of application a thin bead, so it may be necessary to shorten the nozzle by cutting a little off to achieve this. 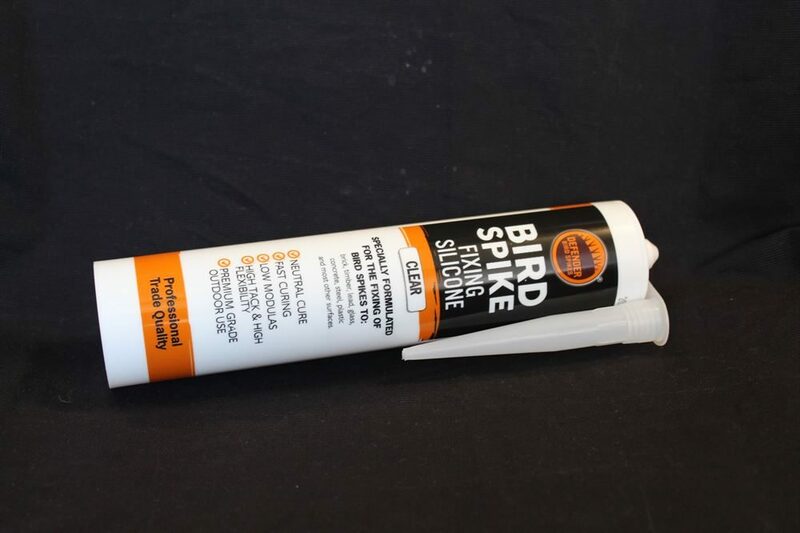 The Defender® Pigeon Spike Adhesive is a clear substance that is unnoticeable once applied to the base of the pigeon and bird deterrent spikes. It has a firm gel-like consistency which holds its shape well while the bird spike is being placed on the ledge it needs to protect from pigeons roosting. Just like the Defender® Pigeon Deterrent Spike bases, our spike adhesive is also UV stabilised, so will not discolour over time making it the perfect accompaniment to the pigeon spike. As it is to be used in predominantly outside areas that are exposed to the elements, it is good to know that this spike adhesive works perfectly in temperatures ranging from -60 °C to 180 °C and is also formulated to be corrosion free. In fact, the Defender® Fixing Silicone has a life expectancy of 35 years. 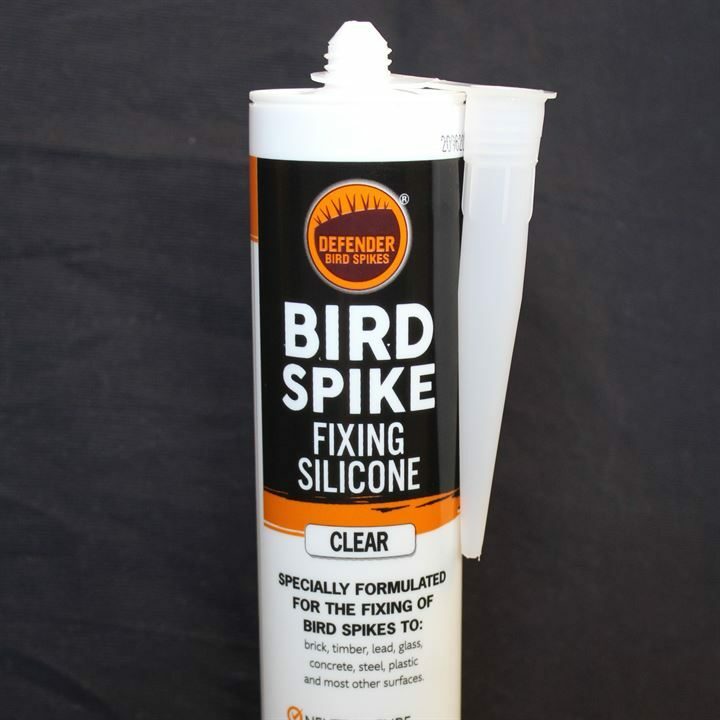 Defender® Fixing Silicone Adhesive Glue has been specifically designed to work in conjunction with Durolon, the UV stabilised polycarbonate plastic used in the manufacture of the bases of the Defender® Bird and Pigeon Control Spike range. When applied directly to the plastic bird spike base and the base is then pressed onto the dry, clean surface, the silicone ensures a permanent fix. Some lesser quality fixing silicones may not stick adequately to the base of our pigeon deterrent spikes, allowing the bird spikes to peel off the surfaces they are designed to protect. Our Defender® Fixing Silicone is used by most pest control companies and councils throughout the UK and conforms to the regulation (EC) No: 1272/2008. Defender® Spike Adhesive is not paintable. Do not use with aquaria, on bitumen or asphalt, polyethylene or polypropylene surfaces. It is the users responsibility to determine suitability of use. Before use always test the suitability by sticking down 1 section of bird spikes for 24 hours.